Robert Lemon was an American right-handed pitcher and manager in Major League Baseball (MLB). Lemon was elected to the National Baseball Hall of Fame as a player in 1976. Lemon was raised in California where he played high school baseball and was the state player of the year in 1938. At the age of 17, Lemon began his professional baseball career in the Cleveland Indians organization, with whom he played for his entire professional career. 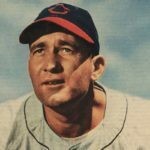 Lemon was called up to Cleveland’s major league team as a utility player in 1941. He then joined the United States Navy during World War II and returned to the Indians in 1946. That season was the first Lemon would play at the pitcher position.